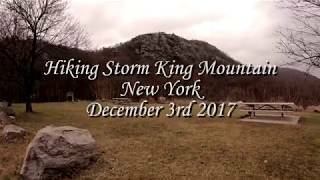 This loop hike offers some great views on the Hudson River and Hudson Highlands State Park across the river. There are several very steep and rocky sections, and two very easy stream crossings. Hikers have the option to start from three different trailheads to access the North Point Loop. This hike starts from the the Butter Hill parking area on Route 9W north for the longest hike. From the parking lot, start on the white-blazed Connector Trail. Follow this trail for about 0.5 miles until the junction with the Howell Trail. Turn right on the Howell Trail which is marked with blue blazes. This next section down Storm Kind Mountain is very steep. After about 3/4 of a mile and after crossing two streams, you'll reach the white-blazed Stillman Spring Trail. Turn left here off the Howell Trail. The Stillman Spring Trail is a wide fire road and continues to descend all the way to Route 218. The trail ends and exits onto Route 218. Hike to the right for about 50 feet, and you'll see the start of the Howell Trail that you were on earlier. Hike up the Howell Trail. This portion is uphill and steep. You'll reach the first viewpoint after 0.5 miles where you can stop to catch your breath and take in the scenery. There are many viewpoints of the Hudson River along the way for the next 1.5 miles until you reach the top of North Point. Continue along the Howell Trail until you loop back to the Stillman Spring Trail and return back up Storm King Mountain, turning left to retrace your steps on the Connector Trail back to the parking lot. This trail was closed for three years in (1999-2002) because an unexploded ordinance was found during a brush fire. The ordinance was from artillery fired from the nearby United States Military Academy (West Point). View of Breakneck Ridge and Mt. Taurus. The views along Howell Trail. North Point provides great views. Howell Trail at Storm King State Park.